There are lots of mountain stream in Norikura Kogen, Japanese alps. You can walk and climb in the river and jump into the waterfall basin. This activities is called river climbing or river trekking. Kids(more than 6 years age) can enjoy this activities and adult too. If you are interested in this river climbing, you need to join the tour. There is outdoor activities company in Norikura Kogen which is Littel Peaks. They are organizing the river climbing tour. River climbing is the best attractive activities on a hot summer and you feel real nature. ※Persons under the age of 18 need to join the tour with parents. They only have japanese site so, if you need any support to reserve, please feel free to contact us. 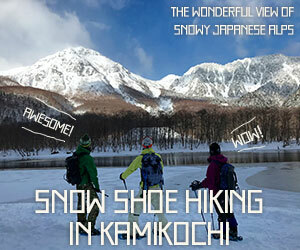 There are many activities in Japanese alps, Norikura Kogen and Kamikochi. Please stay here two, three or weeks to enjoy various activities.